This is a live blog of this TeachMeetNZ discussion. We have a special session for Connected Educators Month. This year a collaborative calendar for October will connect thousands of educators who will be able to engage in free (and freely given) professional learning events, communities and resources. 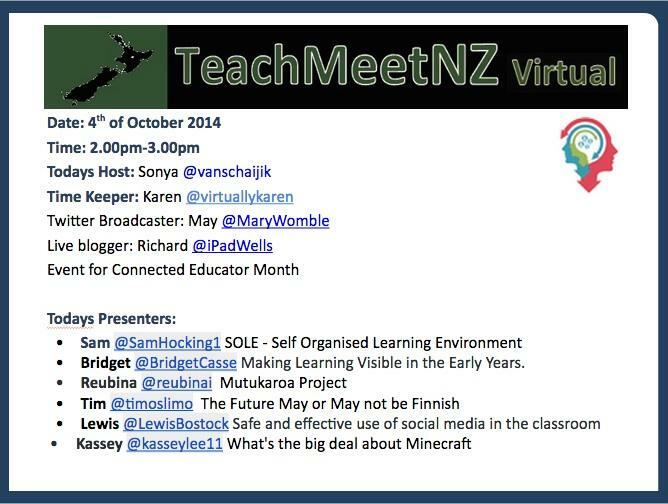 Check out the TeachMeetNZ page for more info here. Here’s the feed / recording. Uses SOLO in the school. Learners know how to meet their goals by clarifying their learning vocabulary. SOLO enables the students to tackle their learning and face complex problems by understanding the journey. SOLO visualises the steps to deeper understanding of any topic. Conversations with students are deeper because they know why and how to learn. Learning to learn is a sustainable skill and Bridget says teachers must get to know SOLO, particularly from those who are already doing it. Sonya supported this theme with her positive experiences with SOLO. Future focused education. Finland has a very successful education programme. It has small class sizes and teachers must have a Masters degree but they don’t use much technology, in fact they are one of the lowest users of tech in Europe. Critical thinking is often lost amongst the glossy talk of new tech and exciting gadgets. It is the way Finland pushes critical thinking and not their use of tech that makes them leaders in education. Bridget thanked Tim for challenging the audience to look at their own priorities. Karen pointed out that the focus on tech often only “tinkers around the edge” of what’s really important. Lewis is a passionate social media user and feels it is crucial for future focused education and learning. Lewis first used Facebook for questioning other adults and then had his students review the responses. He found engagement was immediate, particularly as the format being used was so familiar to the students. He also uses Twitter to connect with students and teachers. Lewis finds that social media will often Redefine (see SAMR) any traditional tasks and create authentic experiences. He encourages us to use the power of the crowd and judge on connections and people rather than likes and Retweets. Lewis suggested that teachers are DJs and social media is the music and our job is to create the best mix-tape! Topic: What’s the big deal about Minecraft? It is simplistic and appropriate for all ages. There is no end point and it acts as a huge sandbox that challenges students to be creative and work collaboratively. Students can manage their own timeframes. Creations can be published and shared between students. Committees of students plan how to construct things and leaders naturally become apparent in this process. Videos are created that allow students to reflect and showcase their work. Kassey had her students create scenes from novels. This challenged the students to show their understanding of their reading and discuss the difference in their visions of how the descriptions worked or not. “Excellent stuff” said Sonya and Bridget highlighted that the students are keen for more teachers to use it. Core are organising it and it’s aims are to organise new ways to collaborate and communicate what’s happening in education. It will offer free professional development opportunities online throughout the month. It invites people to suggest what they could offer others. Check the website out and get involved!!! The tags are #CE14 and #CENZ14 (for the New Zealand stuff).